Sometimes, celebrities say stupid things, so we mock them. Deep, right? It was posted all over social media, usually accompanied by an ecstatic “Oh my God, she’s my hero!” exclamation. You may have posted it yourself. And why wouldn’t you? 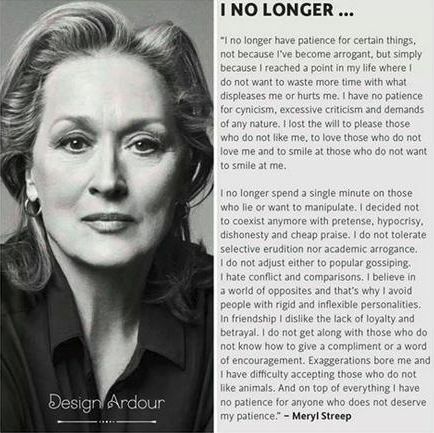 Why not share a quote that makes you admire Streep not only as a talented actress but also as a wise life guru? Meryl Streep rocks! Except, of course…Meryl Streep never said that. The quote belongs to José Micard Teixeira, a life coach from Portugal. But people rarely care about finding out such trivial details. Who’s José, anyway? It sounds much better coming from Meryl Streep. This isn’t an isolated case. Misattributed quotes are all over the Internet. Morgan Freeman never made that comment about homophobia and Pope Francis, while extremely progressive, never said that the traditional notion of God was outdated. Hell, there are so many false, misunderstood, and misattributed quotes out there that I once wrote a TopTenz article just about that. This got me thinking…what if we matched some actual quotes to the most ill-suited people imaginable? Could we make these misattributed quotes sound extremely wrong? This quote reminds me that certain people have no boundaries in dishonesty. José Micard Teixeira was a nobody until he attributed his own words to the famous world wide loved and honoured Meryl Streep only to make waves after and “scream” that his “life philosophy” cannot be “thought” by an actress who doesn’t understand the concept: “one of the greatest gifts of the human being is empathy”. Here are the words of José, who should have thought deeper before building such a scheme. “¡HONOR A QUIEN HONOR MERECE! ¿Por qué no he agregado el “pensamiento” de Meryl Streep junto con las frases de maravillosas mujeres que he compartido? Bueno pues porque algo en él no me daba la certeza de que fuera una frase propiamente de la actriz. Algo en sus palabras, sobre todo en la traducción en Ingles no me cuadraban, sobre todo porque una de las frases de esta extraordinaria actriz es la de que “uno de los más grandes dones del Ser humano es la empatía” y en el texto que se movió por internet, que de hecho me parece muy valioso, la idea no necesariamente empataba con la filosofía de la actriz. So we agree that Meryl Streep had nothing to do with the quote. Good, that was the point. Entertaining stuff, Daniel. I particularly liked the Mike Tyson quote! Mike Tyson is an inspiration to us all! Daniel- this post AND the one you did in 2012 about celebrities saying stupid stuff is HILARIOUS!!! Ending with Jack the Ripper is perfect. I’m glad you told us about Jose! Yeah I find that Jack The Ripper is pretty good at…ending…stuff. Glad you liked it and enjoy learning more from Jose, if you have the patience for such things! Anything that has to do with Donald Trump is scar, up to and including his feeble attempts at using poor toupees to hide the evil robotic squid that lives inside his skull and serves as his brain. Yeah Meryl Streep is the best! I really love her “Ask not what your country can do for you, ask what you can do for your country” quote. It’s almost up there with her “I have a dream” speech. Yes, she’s quite the orator.